Jim Stute (Department Head & Crop/Soils Educator, Rock County Extension) and Megan Chawner helped out an under-the-weather Matt Ruark at the Diagnostic Training Center’s Crop and Pest Management Field Day. As a team, we gave four hour-long workshop sessions, where we addressed current issues with cover crops and prevented planting and viewed cover crop performance in our demonstration trial. 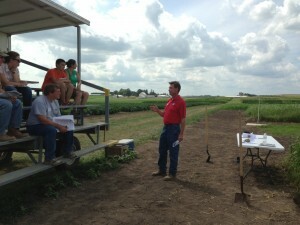 Attendance was about 65 people, which included crop consultants, fertilizer dealers, and government agency employees. Two handouts were provided: (1) NRCS Technical Note and (2) white paper on evaluating the economic trade-offs between prevent planting payments and harvesting a planned cover crop for forage. 1) Are there any drawbacks to a rye cover crop in no-till? Preliminary research at the Arlington Agricultural Research Station shows little to no drawback to no-till corn silage yields (data here). However, there is tremendous benefit to soil by having this soil cover after a corn silage harvest. The key to good management in this scenario is to make sure the cover crop is terminated as early as possible to avoid additional competition for nitrogen and water. 2) Will annual ryegrass (aka Italian ryegrass) winterkill in Wisconsin? Annual ryegrass has been known to survive Wisconsin winters and it is important to have a plan for spring termination. Ryegrass has also been known to develop herbicide resistance. However, ryegrass remains a popular cover crop option when flying seed onto standing corn or soybean because of the relatively low seeding rate (22-33 lb/ac of pure live seed) compared to winter rye (60 to 185 lb/ac) or oats (33 to 110 lb/ac). 3) Which legumes are beneficial following winter wheat? Frost seeding red clover (early spring) or berseem/oat mixture post harvest. Crimson clover will also work post harvest, but berseem has been observed to be more consistent in stand establishment. 4) What are the known benefits of radish? Preliminary data can be found here and current research exists in Rock, Sheboygan, and Washington Counties. Preliminary results indicate that radish will increase nitrate concentrations in early season soil nitrate tests, but not enough data has been collected to quantify a nitrogen credit.